A few weeks ago I did a review on MiO Water Enhancer and told you all that it was a bit too sweet for my tastes. 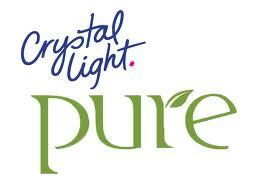 Meg told me about this Crystal Light Pure which isn't made with any artificial sweeteners. 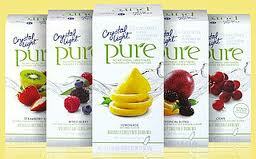 Don't get me wrong, the "pure" part is misleading. There are chemicals in it (duh) just not Splenda or Aspartame. Another thing I've discovered? Kraft Foods makes everything. They manufacture MiO and Crystal Light. I never know this stuff until I go looking for it. Strange, huh? So I tried the Strawberry Kiwi and the Fruit Punch. Both were pretty good. The packets are bigger, and have more calories (15/serving, 30/packet). Not horrible, but still more than zero. I would rather use these than the MiO, because they taste better to me. 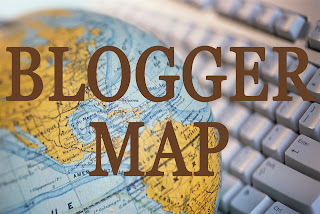 "KMSull and I have been talking about this. I heard they had free ones available on their Facebook and "liked" it but saw they had run out. Then I noticed people posting pictures of their hands after this broke or spilled on them and it WOULD NOT COME OFF. I kind of figured if it semi-permanently stains your hands, then it might not be a good idea to keep around and consume, right?" Amen sister. I just bought some Crystal Light and keep it in my fridge in a pitcher. LOVE that! It's a pomegranate flavor. I need to get some fizzy seltzer and mix them I bet that would be refreshing.